In a previous article, we introduced readers to Google Merchant Promotions. Today, let’s focus on the specific features Google Merchant Promotions brings to your Google Shopping ads. With Google Merchant Promotions advertisers can enrich their Shopping ads by offering promotions to Google users. This means they can add the clickable link ‘special offer’ to their ads for free, helping to increase their attractiveness and differentiate them from other ads. 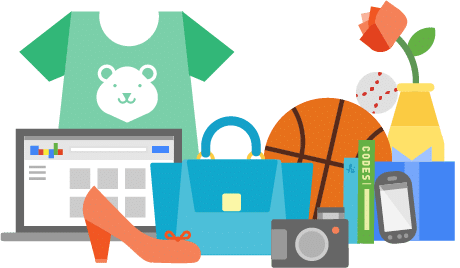 Available in the UK, France, Germany, the US, India and Australia, Google Merchant Promotions works equally well for your online shop and your physical store (thanks to Google Local Inventory Ads). 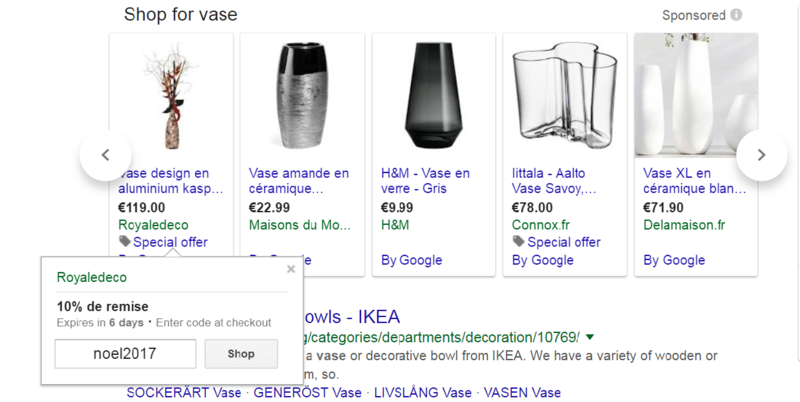 If you send your ads to different countries, you’ll have to create a Google Shopping Promotions feed for each one. To benefit from this feature, you will need to have both a Google Merchant Center account and a Google Shopping feed set up. Once you’ve done that, here are a few tips for configuring your promotions. 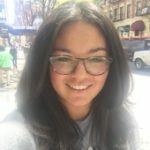 What kind of promotions can you offer? With Google Merchant Promotions you can choose from 3 types of promotions: discounts, free gifts and delivery. When it comes to discounts, you have several options. You can choose to display discounts by pounds or by percentage, or choose to promote 2 products for the price of one. In the example below, Royaledeco is offering a 10% discount with the code “noel2017”. For the free gift promotion, you can either offer free items or a gift card worth a certain amount with purchase. 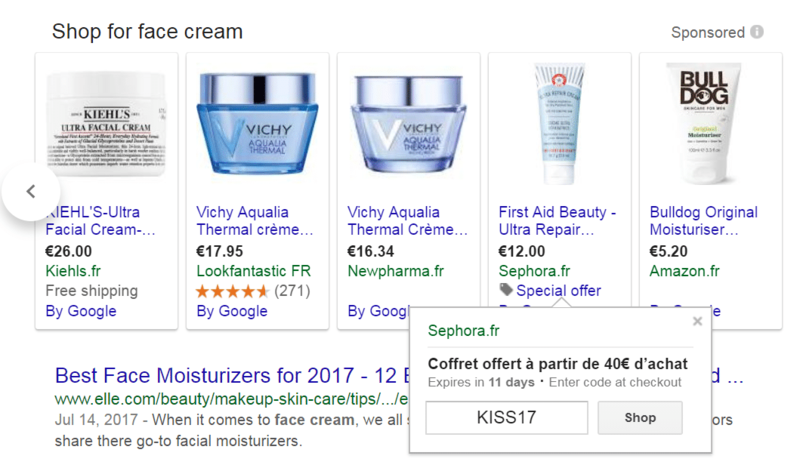 In its ad, Sephora, for example, is offering a free gift when you spend 60€ or more with the code “KISS17”. You can also offer free shipping or reduced shipping costs by adding a promo code. Note: your promotions must be available to all Google users. For Google to accept your promotion, you will need to respect several conditions. Promotions must be applicable at the time of purchase or payment, finish within 6 months of the promotion’s launch date and obviously abide by Google Merchant promotions’ rules and regulations. Firstly, your title must not exceed 60 characters. It must be relevant, clear and concise and must show the value of the promotion. 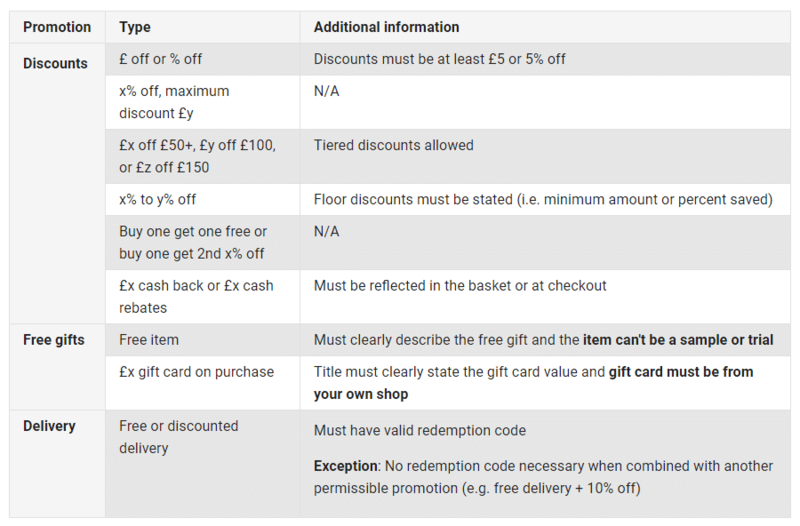 If you want to offer a £30 gift card after £100 spent, the title should be ‘receive a £30 gift card after £100 spent’. Furthermore, you must specify the conditions of the promotion, such as only applicable to a certain product category or a minimum spend amount is required. Small details, such as the promo code and its expiry date, should not be included in the title. Note: if you are sending your promotion to several countries, make sure there are no errors in terms of currency value. To enrich your feeds, optional attributes can also be added such as: ‘promotion_display_dates’, ‘minimum_purchase_amount’ and ‘generic_redemption_code’. Also optional, structured data attributes allow you to optimise your promotions, by providing additional information on the type of promotion you wish to put in place. Example: you are giving a discount of 15% if a customer buys 2 beauty products. In this case, you can add ‘buy_this_quantity’ and ‘percent_off’ as attributes. Note: this structured data allows Google to give mobile users more detailed information on the promotion. Finally, you can also put several promotional offers in place for one item. To do this, you just need to match a product with a maximum of 10 different ‘promotion_id’ attributes. However, Google only displays 5 different promotions per product. What is shown is therefore chosen based on the ‘product _applicability’ attribute. If this is defined as ‘Specific_products’, these offers will appear before those defined as ‘all_products’. Note: every Merchant Center account can have up to 500 active promotions at any given time. It is also important to note that if you do not follow their regulations, Google will remove this feature from your Merchant Center account. To find out more, click here. If you are a client and already distribute your products on Google Shopping, you can easily also add the Google Shopping Promotion feed within our platform. If you are not yet a client, do not hesitate to contact our team to distribute your products on Google Shopping.